This statistic displays dietary restrictions which influence the type of food that individuals eat in the United Kingdom in 2014. 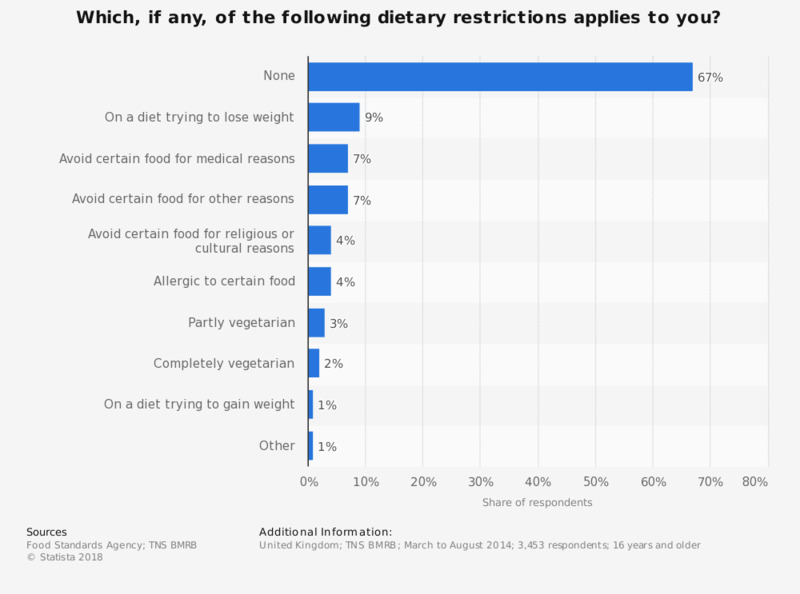 During this period, 67 percent of respondents said they had no dietary restrictions, whereas nine percent said they were on a diet to lose weight. Respondents were able to give multiple answers. In the last seven days, how many days did you eat the main evening meal at home? Which of the following terms do you use to describe your diet? As of January 2018, in Europe, it will be allowed to breed and eat insects. What is you opinion about it? What do you need to do to avoid allergies? How often, if at all, do you personally eat any animal products other than meat, fish or shellfish?